I rarely make jewellery any-more but on the odd occasion, Jo's birthday or as a special favour, I'll take time out to revisit my initial grounding as a jeweller and goldsmith. This is a little ring I made earlier in the year as a birthday gift for a very old friend of mine. It was Jo, my wife, who actually asked me to make it and as I've known the lady it was intended for for about 25 years now it seemed the least I could do. Anyone still talking to me after such a long time deserves at least a little ring as a reward. As a designer I'm very much driven by either a strong sculptural sense of form and line or my approach is informed by the processes I employ and the way they impact on the material. When I went into my studio to "just make something pretty" (Jo's instructions) I had no specific idea in mind. I riffled through my silver box and picked out a short section of a cast ingot, about the thickness of a piece of pencil that would serve as the starting point of a ring shank. I placed alongside it, on my workbench, a few grains of fine silver shot. 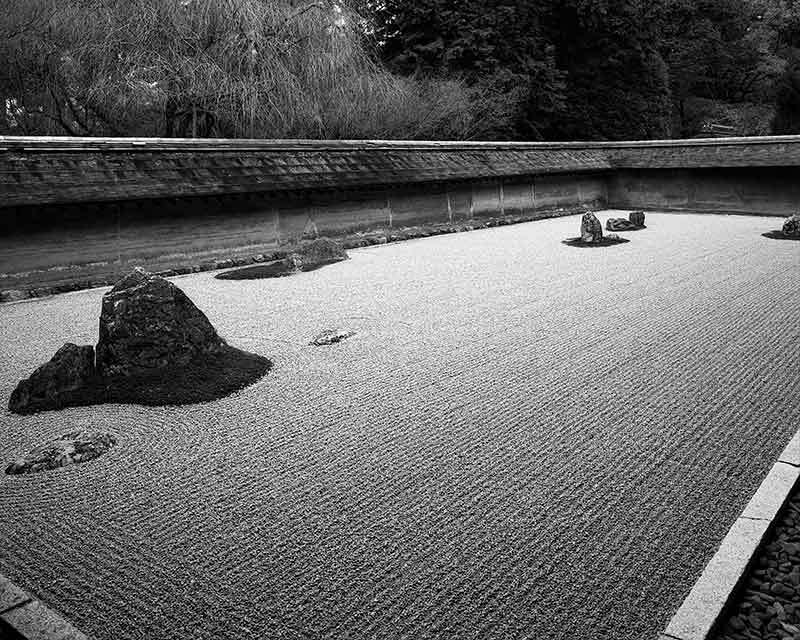 I sat contemplating these "ingredients", a cup of tea in hand, and found myself arranging the silver grains into little formations that reminded me of the famous Ryoan-ji Rock garden in Kyoto. What intrigued me was the seemingly infinite number of arrangements that are possible with just a few pebbles. The real challenge, which is so well resolved in that ancient garden, is that of creating patterns that appear natural or accidental. I think an acute awareness of this quality of "uncontrivedness" is a defining aspect of much of Japanese aesthetics. This appreciation of the "natural" finds it's most obvious expression in the tea bowls used in the, pseudo-spiritual, Way of Tea, the Japanese tea ceremony. This particularly Japanese aesthetic is often misconceived as being simply one that extols the rustic and humble artefact. This is to miss the profound subtly of sensibility that becomes gradually evident when one contemplates those treasures that have been identified for us by the tea masters of the past. 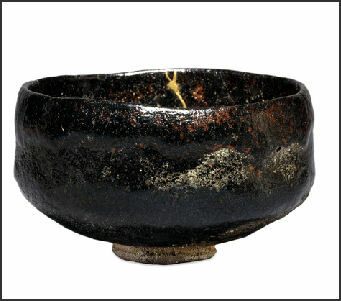 While a celebrated tea bowl may, at first, appear unimposing and "quiet" when we give it space to "simply be" and we allow ourselves to experience it as fully as we can through our, perhaps limited, physical senses we may begin to recognise that there is nothing humble nor rustic about it at all. A great tea bowl is no more humble and rustic than a mountain is. Unassuming, perhaps, but it's undeniable presence and gravitas has the power to point us towards the unfathomable mysteries of our own existence. What the sages of old Japan would have called Yugen. A less well recognised expression of this apparently artless and unaffected aesthetic is to be seen, I would suggest, in the finely faceted surfaces of many traditional Japanese wooden sculptures. The consummate skill and sensitivity of the sculptors of these works is undeniable. The subtlety of the finish so self evident that it doesn't always register as being an "as chiselled" surface. Such is the delicacy and seeming "rightness" of the carved planes that the question of it needing further refinement by way of polishing seems superfluous. This lightness of touch in the hands from a maker is, to my mind, the epitome of making as "a Way". I use the term Way in the classical Japanese or Taoist sense of Dao. As I begun to forge out the ingot to form some idea of a ring shank I was struck by the patterns my hammer blows left in the surface of the soft silver. Like instantly appearing imprints in fresh snow. An idea was born as I moved the silver toward some vaguely intuited cross-section. I left the edges of the strip of metal untouched and so, as it was pushed outwards by my forging, it begun to wrinkle into a delicate stone-like texture. The area between the edges was worked down to form a gentle hollow filled with overlapping elongated ovals of burnished hammer blows that looked for all the world like a rippling stream. The stone, or earth-like, edges rose gently up to contain the stream so that it required almost no real thought to arrange a few silver grains, like river worn pebbles, in this river bed. I am watching your amazing works many times. It made me dreamin' to learn japanese metal carving. I see you're kindly sharing your knowledge. I would love to learn. Thank you.